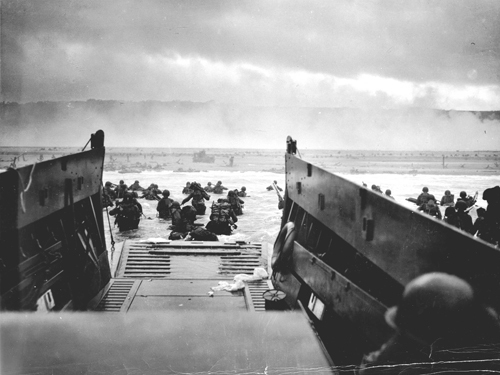 D-Day landing at Omaha Beach photographed by Robert F. Sargent, Chief’s Photographer’s Mate in the United States Coast Guard. In the middle of the 20th Century, philosopher Ludwig Witt- genstein worked on what is called ordinary language philosophy, essentially studying how language works. How do we know what a word means? One of the basic ideas was that if words were taken out of their proper context, the resulting problem would essentially be artificial: All it would take to solve the problem was to simply look into the source of the confusion and pinpoint how language was misused. In particular, philosophy itself would dissolve into a set of constant misapplications of language. So if we ask “what is reality?”, according to Wittgenstein we only think that we are posing a complex, deep philosophical question, whereas in reality we are deceiving ourselves. 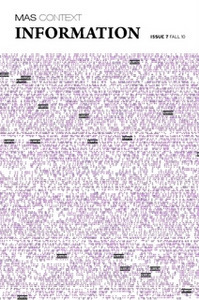 Needless to say, ordinary language philosophy–and Wittgenstein’s writing–is considerably more complex than what I just–very briefly–outlined. What is more, we live in what people like to call the postmodern world, using postmodern philosophy. What does this all have to do with photography? As it turns out, the theory of photography to a large extent relies on postmodern philosophy (think Roland Barthes). The problem with this is that we don’t have to look at things with a Wittgensteinian eye to see that, well, it might not serve us as well as we’d like to think. Of course, postmodern philosophy-heavy on academic jargon-fits very well into the context of the art world, whose theorists also love to use jargon. It is harder to see art theorists using Wittgenstein’s writing–which not only is jargon–free, but which also works very hard to unmask jargon for what it is: A way to create confusion and to pretend there are meaningful, deep problems, when in fact there aren’t any. What we are doing when we ask “What does a photo mean?” is to use language to deal with photography. This seems like an obvious statement, but if we were to be Wittgensteinian, we would realize that the results of our considerations might in fact be misapplications of language that, we think (or maybe hope), are deep insights into photography (consider Barthes’ “punctum” in this light!). Something similar is happening when there are debates about whether or not the staging (or supposed staging) of an image means that what is depicted is not real any longer. 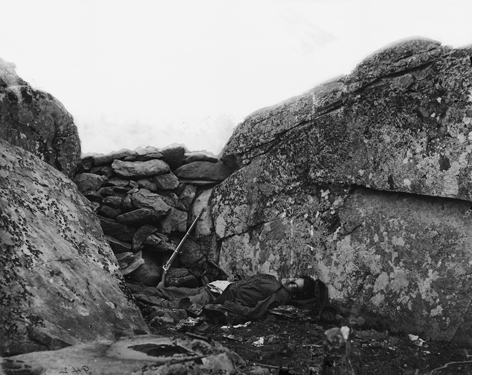 To take an old example, Alexander Gardner staged some of his Civil War photographs by arranging corpses. So is what is depicted less real than it would have been had he photographed the corpses in their original positions? There are many different aspects to this question. At its core lies the problem of whether or not a photographs shows something that is real, how a photograph does it, and what we expect a photograph needs to do. But does the arranging of a corpse on a battlefield to produce an image make the war itself any less real? On a fundamental level, how is arranging a corpse so vastly different from finding a good spot for a photo and then cropping it to make a point? These questions, seemingly about photography, are really about our understanding of images and not so much about the images themselves. Of course, for a full, proper Wittgensteinian treatment we would have to know a lot more about his philosophy; unfortunately, space does not allow to go into more details here. But I think the very first step, the realization that discussing photography might seemingly produce insights, whereas in fact we are deceiving ourselves, deserves to be taken seriously. If we think about it, a lot of the ideas we have about photography are based more on what we feel (or wish) is or should be the case than what actually is. Let’s consider an example. There have been many debates about what is commonly called the Photoshopping of images, and there has been a growing number of scandals about the manipulation of images. The news business (and let’s not forget it is a business first) has reacted to this by demanding that photographers do not Photoshop their images beyond what is considered standard practice. It’s almost impossible to list the various problems that are associated with this. At the base of such rules lies the idea that a photograph presents the facts (or truth or however you want to call it), as long as you-meaning the photographer or a graphic editor–do not mess with it too much. Of course, this is simply not true. Even before doing any kind of processing, the taking of a photograph already includes so many subjective decisions that the idea that photography will show the facts is, well, problematic. Of course, this simple fact has been known for a long time. Yet, only since the advent of digital image processing technologies have large numbers of people started to worry about it. This is in part because we feel that a digital photograph is somehow less real than an analog one. An analog photograph typically is produced from a negative; you print the negative to get a positive. Crucially, you can hold both in your hands. In the digital world, you can print a digital image, but there is no actual negative. Instead, the ‘negative’ is a set of bytes somewhere inside a computer (a digital camera is a small computer with optics attached to it). Maybe this is why people feel that a digital photo is somehow less real than an analog one. You can open your computer and pry open your hard drive, but you won’t find a tiny image impressed on one of the little magnetic disks that are part of your hard drive. If you think about it in terms of images, there is no difference between analog and digital photography. Regardless of whether I look at an image printed on paper or on a computer screen (the analog photo I would have to scan), unless there are clear giveaways (digital noise looks different than grain, and digital photography artifacts usually look different than analog photography ones) we will be unable to tell what type of photo we’re looking at. Yet still, we demand more from digital photographs, we feel we have to define the rules of digital post-processing very strictly. And we feel that as long as we stick with commonly accepted ways to manipulate a photograph, the resulting image is still real, whereas slightly beyond it no longer is. We seem to treat digital images differently because at their source, there is something intangible–even though most of the standard procedures used in Photoshop are equivalent to what people use(d) to do in the darkroom. In fact, some of the Photoshop “tools” have icons that are modeled after the darkroom tools. I don’t want to argue that we should give up on talking about what can or should be done with images. There are very obvious things that should not be allowed in a news context. Instead, now would be a good time to talk about photographic images in general, and that means not only to talk about what they do (and don’t do) but, crucially, how what we do with them and how we think about them gives them a large fraction of the meaning that we think they possess by their very nature. For example, it is not hard to see how accepting the fact that no photograph taken by a human being is objective would be a much better way to approach photography. In that case, we could focus on what images really say and how they say it. We have to realize that accepting that photographs are subjective does not rule out their use in a news context. A lot of the attempts to define what photographers can do with their images on a computer has to do with trying to have images that are credible. If an image is fake, it’s of no use in a news context. The problem, of course, is that it’s impossible to define how much you’re actually allowed to manipulate an image–you can’t measure the amount of doging and burning, say, like you would measure a temperature. But not only that. In principle, all images are fake, because they only show a selected part of what we might want to call “the world” (for a lack of a better phrase). So when we set rules about how much we allow someone to fiddle with an image, we assign a sense of reality to an image that actually does not exist. This doesn’t mean that no image has any relation to what we might think of reality or that we will never be able to use images in a news context. On the contrary, we can safely use images in a news context once we understand how the meaning of images to a large extent is defined by how they are being used. We can approach the problem from a different angle as follows: By restricting the allowed amount of Photoshopping of images, newspapers are essentially trying to solve what is widely perceived as a credibility problem. People mistrust the media. But people don’t mistrust the media because of photographs–people mistrust the media because, for example, time and again they have proven to be unreliable (remember the media coverage of George W. Bush’s case for the Iraq war?). Focusing on images will not make newspaper more credible. On the contrary, by focusing on image manipulation each and every new scandal will only decrease the overall credibility of newspapers. By focusing on image manipulation newspapers–yet again–pretend that the credibility problem does not originate in the newsroom. In an article published on my blog , I provided a very simple suggestion for the problem of Photoshopping: instead of using ill-defined criteria for how much manipulation is allowed, why not make the raw (unmanipulated) images available on the newspapers’ websites? That way, readers would be able to literally see the changes the image went through. Needless to say, the raw image could still be faked, but it would be a much better way to build trust than arcane rules that might or might not be inforced. Manipulated image provided by Sepah News, the media arm of the Iranian Revolutionary Guards. 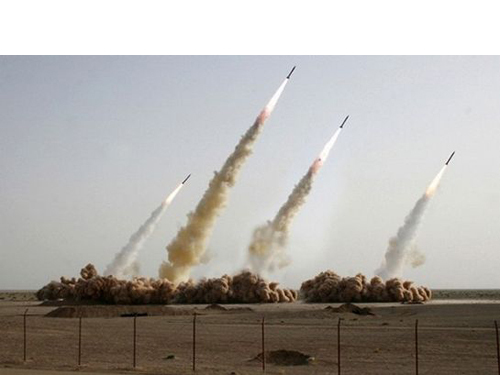 The second missile from the right was added to the original image. The image was distributed by The Associated Press and was published in multiple webs and newspapers before the manipulation was discovered. The anger we feel about each and every image manipulation scandal for the most part is misplaced, especially since there already exist computer algorithms to detect obviously faked images. We shouldn’t be angry at the photographer(s), we should be angry at the editors who obviously didn’t bother to run such computer programs in their offices. It would be much easier for us to deal with such scandals if we realized that a) they are inevitable, b) a newspaper will make every possible effort to detect them, and c) a newspaper will be forthcoming about what a manipulation scandal actually means–instead of merely throwing the photographer in question under the bus, pretending they were just as deceived as everybody else. At the core of this issue lies what an image means. But what an image means is not something that is somehow contained in the image or that somehow comes along with the image. A photograph of my mother obviously has a complex meaning for me, whereas for other people it’s a photo of an elderly lady. We could talk about the facts, but even the facts contained in the photograph are not universal. For me, it’s a fact that the lady is my mother. For another person it might be–if they know me and my mother, and for most other people it won’t be. They have no idea that it’s my mother. Photographic facts are a very complex issue, especially because their relationship to image manipulation is so complicated. In order to move ahead, we need a better debate about photographic facts, the meaning of photographs, and to what extent this has to do with what we feel about photographs. There is no need to involve philosophy in this at all. But I am happy to argue that if we want to invoke philosophers, we might be better served with ordinary language ones than postmodern ones,–and even if it was just to expand our thinking about photography in new directions, to avoid us having to use the same small, tired canon of photographic thinkers. Photography has undergone a lot of changes recently, and it’s about time our thinking about it does, too. Jörg M. Colberg is the editor and founder of Conscientious, a website dedicated to contemporary fine-art photography. He has written articles for international magazines and the introduction to Hellen van Meene’s monograph “Tout va disparaître”. American Photo included him in its list of “Photography Innovators of 2006″.